I'm not a Funko fan since I prefer that my collectibles transform from one mode to another. But Funko toys have become quite the popular item across demographic groups and they're rather hard to ignore at this point. And it's not like I can't say that I've never been tempted - their ability to play on the power of nostalgia is pretty significant indeed. So I wasn't sure how to feel when I started watching Making Fun: The Story of Funko as it wasn't something I was all that invested in. But at the very least it promised to be an illuminating documentary given what little I know about the company at that point. And while this is hardly the most factual documentary about a toy line ever, it certainly managed to cover a lot of ground. But it also had a very strong sort of fan sentiment around it that was overly positive and not necessarily more objective, as you tend to expect documentaries to feel like. Synopsis: Making Fun: The Story of Funko is a documentary written and directed by David Romero. The focus of the feature is the Funko company that markets more than toys but probably memories and nostalgia. Funko history apparently spans over 20 years and there's a lot more to the company than it's now highly popular Pop! line of collectibles. Thus the documentary takes us back to its humble beginnings in Redmond, Washington and how they managed to get themselves on the map with their nostalgia-oriented bobble head toys. Over the course of two years the Eddie Grace film crew gather stories about the company throughout the years and a generous number of testimonials from fans about why they started collecting Funko toys. And naturally a larger part of this feature covers how they got their Pop line started and how that just blew up into something completely crazy on a whole different level. What I Liked: The full journey of Funko and how it managed to craft a business model with the power of nostalgia at its center. And to start with something as seemingly inane as bobble head toys, to grow a massive toy empire is hard to fathom. But that's exactly what Funko did despite years spent still trying to work out of a garage and handle order fulfillment on their own. And it's hard to ignore the joy that some of the fans share in their respective interviews in the documentary. 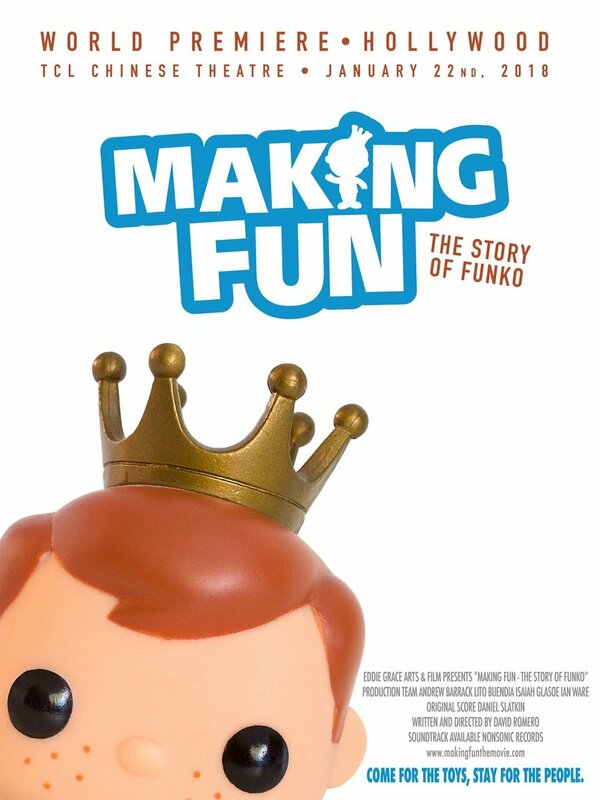 And while it feels like it sort of takes away from the documentary aspect to things at times, the way this was put together just reminds you that the fans are a huge part of what made Funko successful and that contribution to their efforts and what helped inspire new heights of creativity. What Could Have Been Better: The loose and fun way that this documentary was put together does make you question its credibility at times. It feels like for the most part their history was all sunshine and roses apart from the challenge of meeting demand and when the CEO had to step down. But for the most part everything was just up and up and up with more and more creative ideas and more successful licensing deals expanding their reach. The fan interviews and mini-features were fun on their own but at times felt like they ran a little long or just took up more time than they had to. There still feels like more detail that had gone into the discussion of various key points in their growth as a company or maybe some of the other toylines that they had experimented with that didn't quite have the same success as Pop or the bobble heads. TL;DR: Making Fun: The Story of Funko is a fun little piece that feels more like a fan celebration for the toys than a full-fledged documentary. But you can't question the company's success and perhaps a movie this happy is exactly what the franchise deserves. Thus it gets a good 3.5 crazy toys out of a possible 5.